Another day dawns, and all four of Ray Robot's MetaTrader spread betting accounts have suffered another small loss overnight. Another cable short, another -10.0 pips, Ray's bottom line down to £246.00 at both GKFX and Alpari UK. This "false breakout" was however longer lasting than the previous ones. It took 3 hours and 21 minutes on both GKFX and Alpari for Ray's (overly tight?) stops to get taken out this morning. Delayed quotes overnight on November 16/17th 2011 from Alpari UK's spread bet feed. 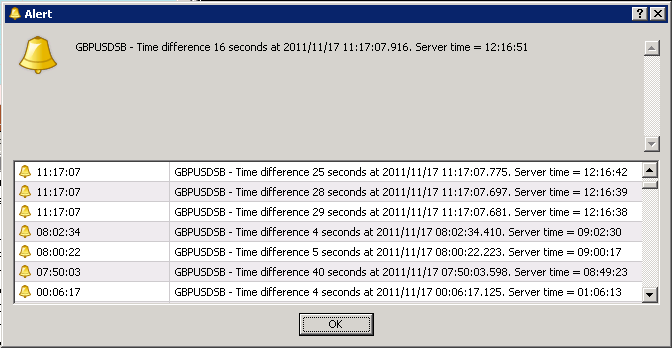 Delayed quotes overnight on November 16/17th 2011 from GKFX's spread bet feed. GKFX's worst case delay was 40 seconds at 07:50:04 this morning. Since these long delays occur at different times on different brokers it doesn't seem as though they could be caused by a problem with the internet connection to our VPS, does it? Just for the record the ping time from our virtual private server to Alpari's servers averages 1 millisecond, whereas for GKFX's server it averages 2 milliseconds. I wouldn't be able to get the results I was expecting. The delay means the price would have already changed.